Brad Fitt, who plays the lead of Mother Goose in Shrewsbury’s panto, opened a new outdoor pre-school at Katie’s Kids Nursery in Monkmoor. He joined the staff and children who attend the pre-school in the celebration. The outdoor space was transformed into a natural classroom where the children could learn and explore. There is an outdoor kitchen with a working clay oven for children to use to cook the food they make. The nursery, which is run by Katie Wellington and her business partners, Amy Hagemann and Nick Russell, opened its doors in 2014. Nick said to the Shropshire Star: “The children are encouraged to explore and develop their independence by using tools and equipment, building dens, learning about their natural environment and enjoying stories around the campfire. “Where possible, we have recycled material and been creative to encourage respect for nature. Rainwater now runs from the guttering into a funnel that feeds the water wall; is used in the mud-kitchen’s sink; and also fills the pond for our resident frogs. 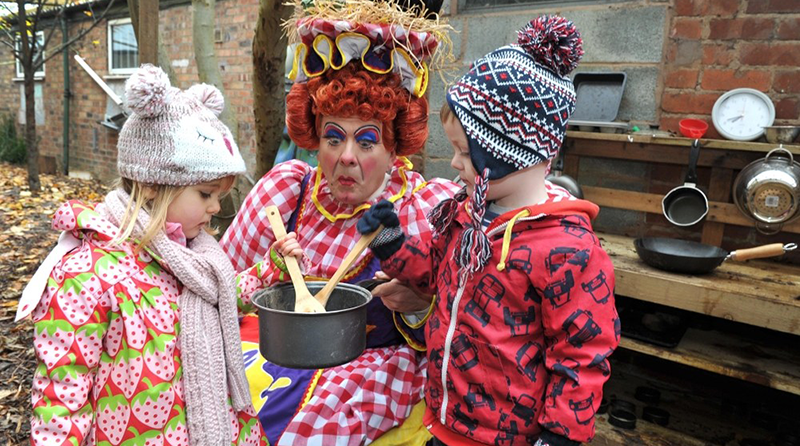 Children also attend a weekly cookery class – ‘Katie’s Kids Kitchen’ – which has been sponsoring the Shrewsbury pantomime for the past four years. For the special occasion, there was an egg hunt around the new garden, for which the children produced a giant nest and 70 golden eggs, one for every child. There was one lucky egg containing a family ticket to the pantomime’s opening weekend. Ms Wellington said: “The pantomime is the beginning of Christmas to me; one of my favourite nights of the year. We are delighted to be supporting the theatre again this year. “It’s wonderful that Brad could come to help us celebrate this new and exciting chapter for the nursery.